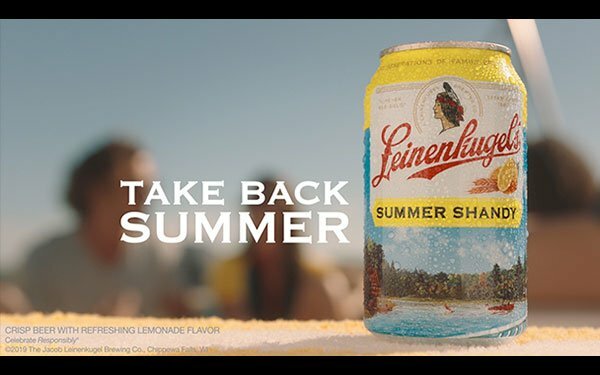 MillerCoors’ Leinenkugel’s is gearing up for warmer days with the new "Take Back Summer" campaign, developed with Mono. It’s designed to introduce the brand into locations and occasions to match a shift in strategy to appeal to a wider — albeit still young — demographic. The "Out of Office" creative shows Millennials enjoying a boating trip while the a young woman using a wakeboard texts she is at a "skills training seminar." Other spots show Millennials putting away their devices to enjoy a shuffleboard game and roof-top party. The campaign strategy is grounded in the Millennial phenomenon to be seen as "work martyrs," dedicating much of their time to their workplace and career advancement, and often at the expense of enjoying summer. “We found a tension between the product – a beer made for those wonderful warmer months – and the brand’s core customers who feel pressured to sacrifice those fleeting summer days," explains Michael Hart, Chief Creative Officer & Founder, Mono, adding the agency leveraged this tension to foster a campaign that helps create urgency for Millennials to better balance their time by drawing clear boundaries between work and making the most out of summer. Audio ads on Pandora and Spotify feature the voice of Leinenkugel's family member and brand ambassador, John Leinenkugel. And images will be used for e-commerce, the brand’s website, point-of-sale and on-premise locations like bars. Mono is spearheading a new social media presence that will introduce a series of product release videos on a rolling basis throughout the summer and will interact with fans through various pieces of user-generated content, which will run primarily on Facebook with significant paid support. Mono also developed a Snapchat lens and Instagram GIPHY stickers. The Leinie Friday promo program encourages people to take paid-time off on Friday to enjoy their summer (naturally with Leinenkugel’s Summer Shandy). This represents the first work Mono has created for the brand since joining the client’s agency roster last summer.